Sometimes it does not pay to be curious. Curiosity is dangerous. In Karl Magnussen’s case, it cost him his life. Considered to be one of the foremost theologians of his time, Karl has to passions in life: his wife and his research. When word reached him of some strange religious practices taking place in the small village of Lake in the Hills located in The Vintage, the scholar wasted no time traveling there. Upon arriving, he soon discovered that not everything is what it seemed. Evil lurked, and its’ embrace not only encompassed the village but if left unchecked, might threaten The Vintage as a whole. Sadly, Karl was not fast enough to flee, and he soon found himself in the embrace of this growing evil. His life lost due to his curiosity, Karl is just another victim in the plot. Worried, and unaware of her husband’s fate, Karl’s wife now seeks answers. To get these answers, she hires a group of adventurers to locate her husband and help her discover his future. Following Karl’s trail, they slowly hear rumors emanating from the area. These rumors are both unsettling and deeply concerning. 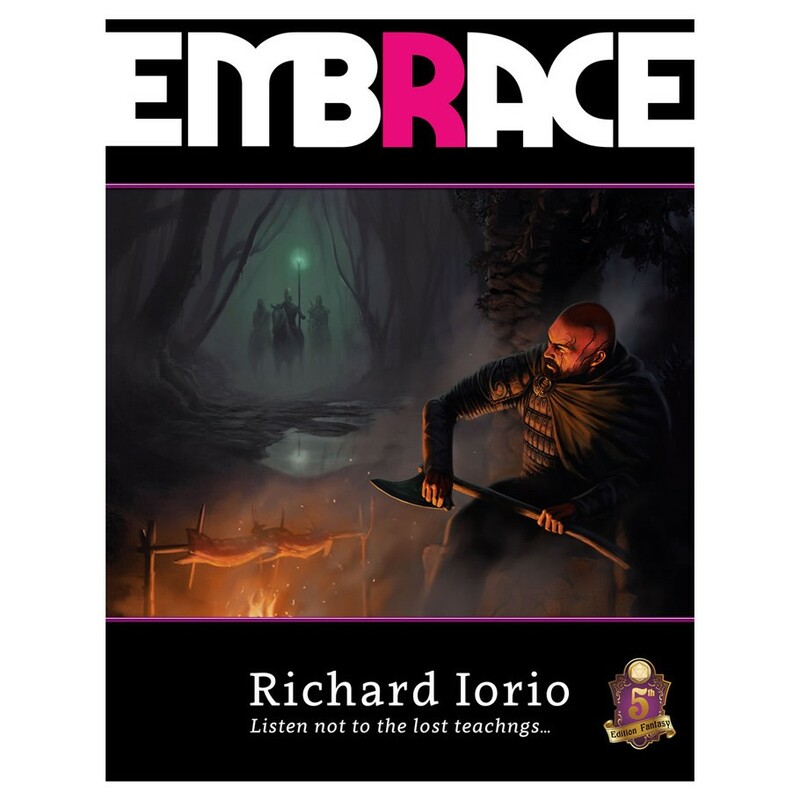 Embrace is a voyage into the heart of an evil plot. Something strange is happening, and long-held beliefs are being perverted to fit another’s evil ways. How the characters accomplish their task and handle the looming crisis, is another matter all together… Sometimes it does not pay to be curious. Curiosity is dangerous. In Karl Magnussen’s case, it cost him his life. Considered to be one of the foremost theologians of his time, Karl has to passions in life: his wife and his research. When word reached him of some strange religious practices taking place in the small village of Lake in the Hills located in The Vintage, the scholar wasted no time traveling there. Upon arriving, he soon discovered that not everything is what it seemed. Evil lurked, and its’ embrace not only encompassed the village but if left unchecked, might threaten The Vintage as a whole. Sadly, Karl was not fast enough to flee, and he soon found himself in the embrace of this growing evil. His life lost due to his curiosity, Karl is just another victim in the plot. Worried, and unaware of her husband’s fate, Karl’s wife now seeks answers. To get these answers, she hires a group of adventurers to locate her husband and help her discover his future. Following Karl’s trail, they slowly hear rumors emanating from the area. These rumors are both unsettling and deeply concerning. Embrace is a voyage into the heart of an evil plot. Something strange is happening, and long-held beliefs are being perverted to fit another’s evil ways. How the characters accomplish their task and handle the looming crisis, is another matter all together… Originally designed for Shadow, Sword & Spell Rogue Games brings you a new version adapted especially for 5th Edition. Now you can experience it for yourself.